Hey everyone! Glad to be back to this blog series as I have tested my gear even further while on my route across the country from New Hampshire to Southern California. I really appreciate all of the support and love on my website as well as my social media pages, I couldn’t do it without all of your awesome support. This write up is going to be about an incredible flashlight that works also as a charging device for anything with a USB. Now there are tons out there and I actually have a couple other ones that include some of the very same features as the Goal Zero Torch 250 Flashlight with Integrated Solar Panel. But none of the have all of the features this does. Now this thing is in the $65-$75 range when buying through amazon so it is a little pricey but going on 3 years of owning it I have had no issues and am close to snagging a second. I tend to lose all of my flashlights but this one always has my eyes on it because it easily the most useful. With always being able to charge it up on the go I leave it on my dash while driving around throughout the day. Let’s get to some pros and cons! 1- No battery costs. With a solar panel and a separate USB for plugging into an outlet this thing is so easy to always use, did I mention there is a hand crank if it were to die at night and you have no outlet? Well yeah it has that too so you are ready for any situation. 2- Light Options. 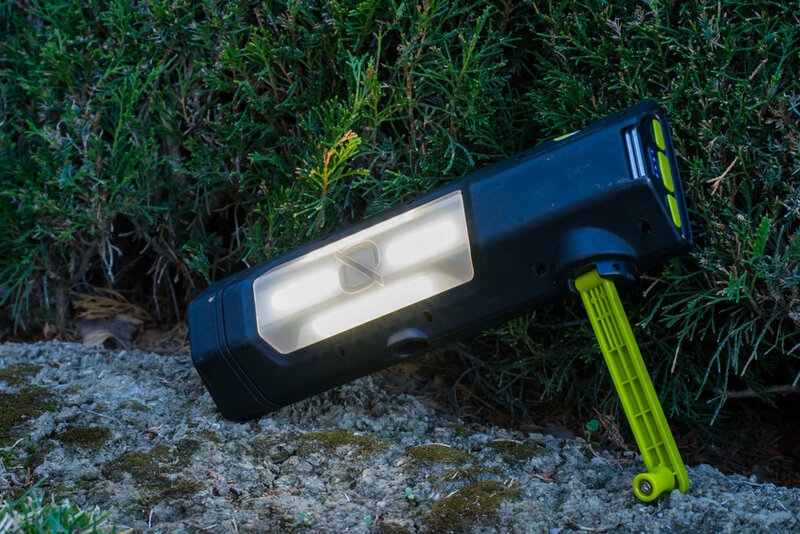 Not only do you have a normal flashlight, you also have a floodlight making it perfect for those times you need to work on your rig or setup camp in the dark. Don’t forget it also comes with red emergency lights which come in handy when stranded or even stuck on the side of the road. 3- Hanging Hooks. Need to use both hands but don’t have a buddy? Well this little guy has two hooks that cross over each other making the perfect hanging tool. They overlap making it the perfect hanging hook, it wont fall on your head or fall into your engine bay! 4- USB Charging Port. Need to charge up your phone to keep capturing moments on your adventures? Just throw your charging cable into the torch’s USB and charge that baby up. I’ve also used this to help charge my laptop when I need to edit photos at a campsite, with both the solar panel and hand crank this thing can be going for hours. 1- Size. It’s an awkward shape and size, it doesn’t fit too well into a small backpack and it can be too big for some smaller hands. But utilizing the hooks in that situation works perfect to help grasp it or secure it to the outside of you backpack to charge. 2- The hand crank takes a while. Cranking it will take you a decent amount of time and effort. Although in an emergency situation it is very useful as one minute of cranking will on average support 2 minutes of battery life. I recommend keeping it charged up using the solar panel and USB connection while an outlet is available that way when worst comes to worst you can use that hand crank for some extra juice. 3- Flood could be brighter. It’s bright don’t get me wrong but it’s not that bright. I could use a little extra and I often have an extra person hold another light when I have the option but I have spent many nights working on my car with it hanging by the hooks lighting up my engine bay or setting up camp late at night. All in all, I would say this thing is my favorite flashlight I have owned. Super easy to recharge with the three different options, different light options for ever situation as well as a dimmer to help save battery life and helps you out when you need to charge up your devices. 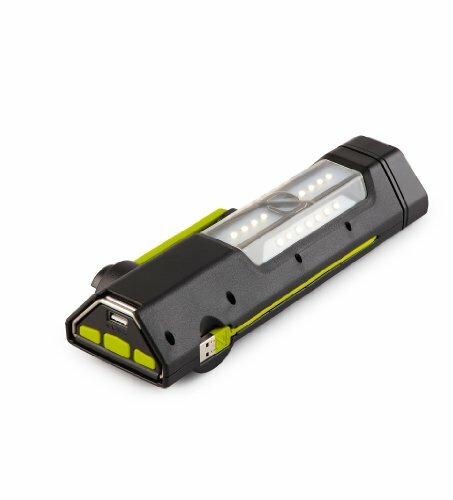 I would highly recommend it to anyone in the market for a solar charging, hand cranking flashlight that’ll also charge your devices. I have no regrets in purchasing it and like I said earlier I am about to pull the trigger on a second one to keep as a spare. Below I have the amazon link for it, if you want to purchase it through amazon I would be stoked for you to use my link as that helps me continue on with these product reviews and adventurous lifestyle! I do not work for Goal Zero this is just an awesome product that I fully stand behind. Feel free to leave comments and questions and I’ll get back as soon as possible. Cheers everyone! Stay tuned for more reviews. Round three! Traction ramps have become one of the most popular recovery devices for overland enthusiasts, the only problem is that they are so expensive. While trying to find the right set for me I toyed with the thought of about five different brands or styles of traction ramps. The thought of using aluminum seemed like it would damage my tires if I spun them on accident, I didn’t want to drop over $300 on a set and I didn’t want to just use some old carpet that would get nasty and not be able to be easily washed off after using in some deep mud. Well, after a few recoveries with the set I ended up pulling the trigger on, I can say they have held up great. From the California deserts to the woods in New Hampshire they have worked well in a range of climates and situations. I have had no issues with mine, literally nothing has gone wrong or been cumbersome. I can say these may be the cheapest and best insurance to make sure you won’t need to pay for an extremely expensive or time-consuming tow. Ok, I’ll get to the point, I am doing a review on the MAXSA Escaper Buddy traction ramps. There are cheaper options out there, there are more sturdy options out there and I’m sure someone has found an entirely better idea when designing these but I can’t say these have caused any issues. With their identical competition being MaxTrax I can say that you won’t be needing to spend $325 for two pieces of plastic and $149 will do the job just fine. 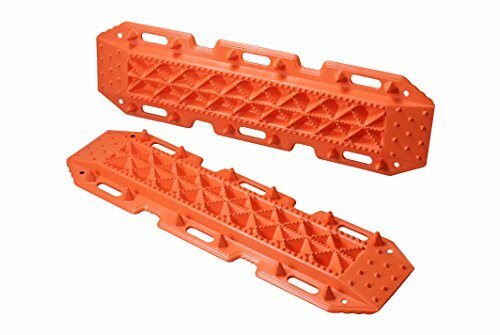 I’m not saying the MaxTrax don’t work but when considering a set, I would highly consider the MAXSA if you are going to get this style plastic traction ramp. With Christmas around the corner I’m sure you know someone looking for a set of traction ramps. With them being an awesome alternative to digging for hours, using sticks and pieces of wood for a hard surface to get some traction and even provide to be useful when there are no trees to winch off of they are a piece that should be in every off-roading family’s quivers. It not only is a cheap way to make sure you end up to your base camp but is also useful to help out someone else that got themselves buried in the sand or mud. The Amazon link is below so don’t hesitate if you are looking for a recovery buddy, these will get you out of many tough positions. Cheers! Hey everyone! I have another product I’m going to be reviewing! In the past I have reviewed other light companies but recently I have partnered up with Nicoko to see what their new pods are all about. I haven’t ever been a big fan of having tons of different colored lights on my rigs but it was time that I see what it’s all about. My Nilight LED pods weren’t that bright so I needed to change them up anyways. These lights have been an awesome addition allowing me to see more than I had been able to with my Nilight pods. My main attribute to picking a light is the brightness and the way the light is thrown. Not only do these have a much better throw of light but they are also noticeably brighter. I haven’t used the colored halo for while driving but it gives a pretty cool option to color match the light to something else on your rig if you are into that. It can be a great appeal for that sense or even something fun for playing some music while everyone hangs out while wheeling you can set the lights to strobe. You can set the actual projector LED’s to strobe as well as different settings for the halo to change colors. I’ll be doing a video soon on the changing colors to keep your eyes peeled! These lights come with their own wiring! This is an awesome thing, I usually hate having to separately order some wiring or go down to the hardware store to grab some wire and a switch. Oh, then I usually forget some connectors so it always becomes an issue. This doesn’t even go on because everything is provided in the order for you, the wiring is also specific to these lights. This can be an issue or a blessing as it seems like some quality wiring. I don’t know about the possibility of splicing them if you need to add wiring but they work great if you have the pods as ditch lights or at an even distance apart. It took me about 10 minutes total, adding in removing my old lights, installation was a breeze due to the simplicity in the wiring they supply. Did I mention you don’t need to drill for adding a switch? These come wired specifically to run off a remote they supply so that you can change the color of the halo on the edge or the main led lights. I don’t know how much I like this as I’m afraid of losing the remote or it running out of battery when I’m out exploring but I guess I’ll throw an extra battery in my glove box and cross my fingers I don’t misplace it. It is definitely nice to not add more switches all over if you don’t want to damage or change your interior. I would say this will be an increasing trend for the average guy looking to add some lights because drilling a spot for a switch or adding a switch isn’t sometimes an option for some people. All in all, I’m stoked on these. They aren’t super cheap but they are definitely worth the price if you are looking for a specific colored halo led pod. I’m excited to see how the amber color halo works for dusty conditions, they will be perfect for those long backcountry trips where I need a little extra light. Best part, they are available on Amazon. This means you can have them to your door within a matter of days. Right below I have a link so you can check them out on Amazon, don’t be afraid to check out their other lights, they make anything from 52” bars to supposedly coming out soon rock lights. So, check out the link below, check out their Instagram page here and see if they are the lights for you! 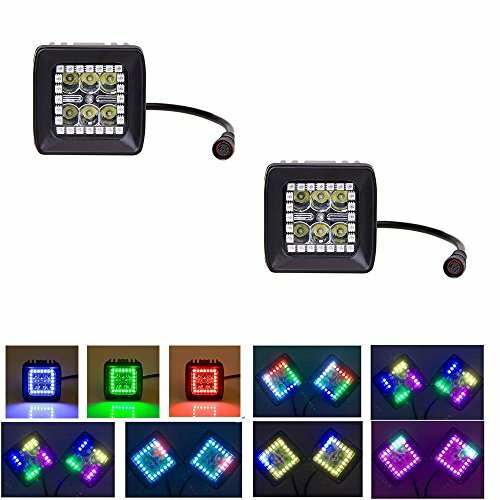 They are always doing some awesome giveaways on lights so pay attention to their Instagram page so you don’t miss the chance on some free lights! Hey everyone! The first product I’m going to review is my ARB awning. If you have been a long-time reader I’ve posted an article about the awning before but this is going to be specifically about the product. No fluffy stuff here just straight to talking about the good and bad of the product. Although on this one I really can only say good things. Let’s get started! Before I got my awning I had my eye on it for a while but never pulled the trigger because of not knowing anyone directly that had one. Well I have one and here is my full review. It is an awesome piece to my rig, if not my favorite. I’m from California and having shade in the desert is something you don’t find very often so having your own source of shade wherever you go attached to your vehicle is priceless. 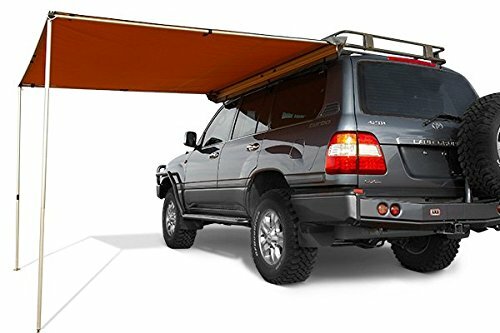 Not only is this thing killer for blocking out the scorching desert sun but it’ll keep rain off of you if you plan on sleeping outside at night. The price tag can make some turn away instantly and I totally get that but with so many high-end off-road products that are all very similar to this and even fancier it actually is at the bottom end of the scale when it comes to the price tag. Here are some pros and cons to the awning. 1. Effective – Need the sun off your shoulders? It’ll do that. Need to cook in the rain? It’ll keep that off of your cooking area. Have some wind? It comes with guy lines to help secure the awning to the ground. Different height vehicle and not sure if it’ll go tall enough? If you can reach the awning from the ground while it’s attached to your rig you’ll have no problem. 2. Price Tag – Have you been looking around at awnings for your new build but you can’t decide because of price? With many other awnings out there now, this actually comes in at an affordable price as well as different sizes for different prices so you really get what you pay for. ARB is definitely a reputable brand and for the price I paid I couldn’t be happier. 3. Quality – Having nothing damaged after over a year in multiple weather conditions has been well worth buying. I have been in 30 mph and higher winds, I have been in down-pour rain storms and I have been in 110+ temps in the desert. None of these conditions caused anything to break or get damaged. If you set the awning up properly you won’t have any issues with this getting damaged. High winds force you to sometimes turn your vehicle or change the awning so it doesn’t act like a kite. 4. Dual Zipper – This may sound a little weird putting a pro as a dual zipper but I promise it’s awesome. When storing the awning back in the bag it can be a little tricky but having a dual zipper on the bag helps tremendously with making sure it gets closed to be safe during travel. 5. Add-On Features – If you plan on getting it, awesome. But there are so many other reasons to buy it and I have one of the other key pieces to this product. From a mesh room, wind protection sides and even a fully enclosed tent room there are a bunch of options if you feel that just the awning isn’t enough. They do cost more for the extra pieces but they are well worth buying after you’ve gotten the awning. I’ll have a whole separate article for just the awning room soon once I get a couple more uses out of it. 1. Hard to Do Alone – You will probably need help setting it up as well as putting it back. It is a little awkward with a few moving pieces but as long as you go slow you won’t break anything. I have heard of people bending poles or breaking the hinges but unless you are just pissed off and throw it I really don’t see how people have had these issues. The awning doesn't come with the entire room. Out of all of the pro’s to only have one con against the product is pretty awesome. After owning this thing for over a year I would buy another if I had the need because it is one seriously cool product. Not only will it make you look like you overland but anyone from the soccer parent to the rock crawler should have one. Thanks for reading everyone! Keep your eyes peeled for new content coming out and don’t forget to throw your email in the subscriptions if you haven’t already. The direct link to buy is below! Hey everyone! I know it’s been a while but I have been super busy with some awesome photoshoots. Anyways, I am starting up a new blog on my website! This blog will be targeting products that I use from Amazon. This may make you think that I am being paid by these companies to market their product on my blog but you’re wrong, these products are either used by myself specifically or by others that have recommended them to me. As most of you know my blog and website is what I generate my income off of for being able to support myself while I travel, anything I can do to put out awesome content while being able to afford to continue to put out valuable information for all of you to read is my goal. The way Amazon Affiliates Program works is that they are paying me 10% of what you pay for that product after clicking the link directly from my blog post. This is what keeps me afloat and able to product content for you to see so please support me by grabbing a product through my link if you have been on the fence about ordering it. With this new blog I feel that I will be able to help you better your camping or overlanding gear to ensure an awesome experience in the outdoors. These reviews will be anything from off road lighting, camera gear or even other camping equipment. All of these reviews will have the exact product linked directly to Amazon so that you can have it on your doorstep in a matter of days after reading. If you have gear that you recommend me reviewing and writing a post about I highly encourage readers to contact me with that info so I can share it with the rest of my followers! Getting to educate others about gear choice, camping routes or even on how to do something is my overall goal and this new blog series may be the best idea I’ve had so far. So, when you see the new posts be sure to click and read, you never know what gear you’ll need next! Cheers everyone and get ready for my first post!